It’s probably a safe bet to say you will have plenty of candy leftover after Easter. I’ve found myself in this predicament dozens of times. 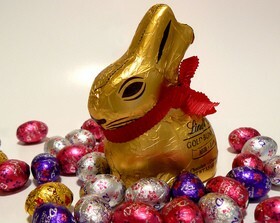 Chocolate bunnies or Easter eggs can be easily melted in a double boiler or even in the microwave. Once the chocolate is hot and smooth, pour it into candy molds. 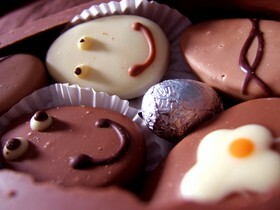 These tasty chocolates can then be used to create beautiful chocolate gift baskets or chocolate bowls. Chocolate can also be melted in a double boiler or in the microwave to make ganache. When the chocolate is completely melted, add 2 tablespoons of heavy cream.Ganache is great when poured over vanilla ice cream and topped with nuts, a little whip cream and a cherry. Another way to use leftover Easter chocolate is to make chocolate fondue. Dip strawberries, pineapple, kiwi and other fruits into the melted chocolate for a delicious treat. Chocolate covered strawberries are another fun snack that makes a rare treat or the perfect food to serve when entertaining at home. You can also chop up leftover chocolate, then add it to a cake mix, cookie dough or even pancakes. 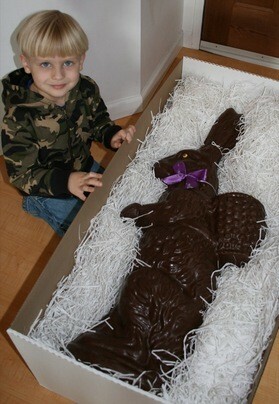 Or, shaved chocolate can be sprinkled on the icing of your favorite cake or cupcakes. For the best chocolate treat of all… you’ll want to try a chocolate facial. It’s refreshing, relaxing and great for your skin! Don’t you just love Easter M&Ms? The pastel colors are not only pretty, but tasty too! They remind me of spring blooms. Easter M&Ms can be added to cookie dough, a cake mix or pancakes for a special treat. They can also be added to a crystal or glass bowl for a spring centerpiece when entertaining. Just add a few artificial daffodils and tulips to give your table the essence of spring. Those classic Easter candies known as marshmallow Peeps can be used to make Smores. 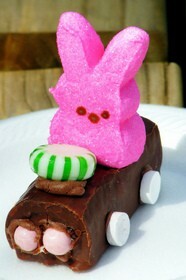 Just replace the marshmallow with an Easter peep. It’s also fun to put peeps in the microwave and watch them expand. This makes a gooey treat for kids, and they love them! With leftover Easter creme eggs, you can make some creme egg muffins. Another idea is to remove the original wrapper and use colored foil or cellophane to wrap them. Creme eggs wrapped in gold foil can be used for Christmas, or place them in a plastic cauldron at St. Patrick’s Day to represent a pot of gold. You can even use leftover Easter candy to make holiday decorations for your home. The colored eggs can be strung on a piece of cord to make garland. Green Easter candy can be used to decorate on St. Patrick’s Day, or combine green Easter candy with red candies to decorate for Christmas. Red and white Easter candy can be placed in a crystal or glass bowl and embellished with holly for a Christmas centerpiece. Leftover pink and red candies are perfect for Valentine’s Day centerpieces or other Valentine decor. I have used red candy to add a splash of color to my hurricane lamps. The flickering of the white pillar candle on the red candies gave the room a romantic ambiance. Overall, it’s easy and fun to decorate with leftover Easter candy and it gives your home a festive look at any time of the year! Bunnies And Ham And Eggs… Oh My!